Sixteen years after a deadly virus wiped out most of Earth's population, the world is a perilous place. Eighteen-year-old Eve has never been beyond the heavily guarded perimeter of her school, where she and two hundred other orphaned girls have been promised a future as the teachers and artists of the New America. But the night before graduation, Eve learns the shocking truth about her school's real purpose -- and the horrifying fate that awaits her. Fleeing the only home she's ever known, Eve sets off on a long, treacherous journey, searching for a place she can survive. Along the way she encounters Arden, her former rival from school, and Caleb, a rough, rebellious boy living in the wild. 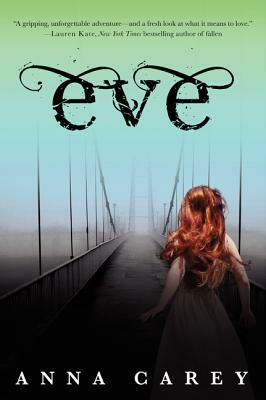 Separated from men her whole life, Eve has been taught to fear them, but Caleb slowly wins her trust . . . and her heart. He promises to protect her, but when soldiers begin hunting them, Eve must choose between true love and her life. In this epic new series, Anna Carey imagines a future that is both beautiful and terrifying. Readers will revel in Eve's timeless story of forbidden love and extraordinary adventure.